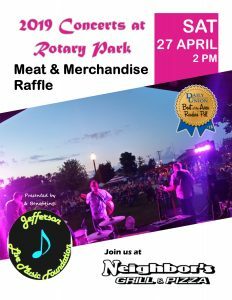 The 2019 line up will be announced Saturday, April 27th at the 2019 Concerts at Rotary Park Meat & Merchandise Raffle being held at 2pm at Neighbor’s Grill and Pizza. Concerts start at 7pm and take place at Rotary Waterfront Park, 301 S. Gardner Avenue in downtown Jefferson. Food and beverages will be available for purchase.